In the late 60's The Rev. 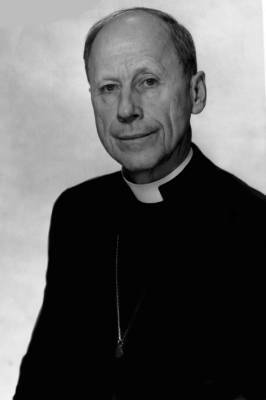 Dr. Fred Schiotz, then President of the American Lutheran Church (ALC) suggested that the church begin to use the title "Bishop" rather than the then current term, "District President", although he said he himself would not use the title. And so it began, slowly at first. Old issues of The Lutheran Standard will show both usages, with the title of bishop soon to be officially and universally used. The Lutheran Church in America (LCA) soon followed suit. The Association of Evangelical Lutheran Churches (AELC), a break-away group from the Missouri Synod (LCMS) also began to use the title, and with the merger that resulted in the Evangelical Lutheran Church in America (ELCA) the usage was established, along with amethyst pectoral crosses, purple clericals, crosiers, and even a few miters. To understand what this really means we need to look at two things. The first is the discussions that the ELCA and the Episcopal Church (ECUSA) had that resulted in the Concordat and its successor documents that brought the churches into communion with one another. One of the results of the talks, and one of the goals of the documents is to restore the historic episcopate in the Lutheran Church. 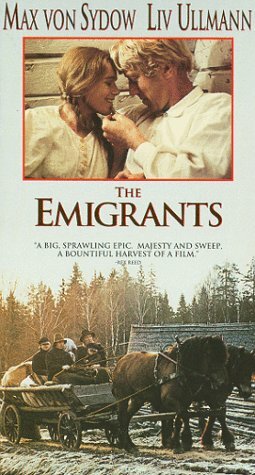 The second is Ingmar Bergman's films, The Emigrants, and Fanny and Alexander. In these films we begin to see where all of the heat and opposition to the provisions of the agreements between the two churches come from. Especially in The Emigrants we see the arrogance of the Swedish episcopacy and clergy (The Church of Sweden maintained the episcopacy and the historic succession) shown toward their Norwegian (and, presumably also toward their Swedish) flocks. Out of this class struggle were born the anti-clerical movements in Scandinavia, fed by the pietism that swept across both protestant and Catholic Europe. So in North America, these sons and daughters of immigrants from Norway have opposed the agreements with the Episcopal Church. Other influences are there as well, such as the democratic organizational tone of American institutions, and the corporate tone as well. But it is this independent, congregational approach, which feeds a great deal of the debate. Even in the ELCA, the bishops have a short term (see note below), not enjoying the permanent tenure that the Episcopal brothers and sisters enjoy. Pastors, who froth at the mouth about the long-term rule of bishops, never argue about their own permanent tenure, which they hold in their various calls. It's a power struggle. Which finally brings me to my point. The Diocese of California is in the process of electing a new bishop, Bishop Swing having announced his retirement. As an outsider looking in, it always seemed to be a bit of a coronation, but I should have known better. Elections of bishops in the ELCA are more common, since they happen more often. Who they are and how they are elected seems limited to the interested, or the involved, but certainly not to the average person in the pew. In the Episcopal Church, the bishop is indeed a touchstone, a center, and a point of contact for the whole Church. 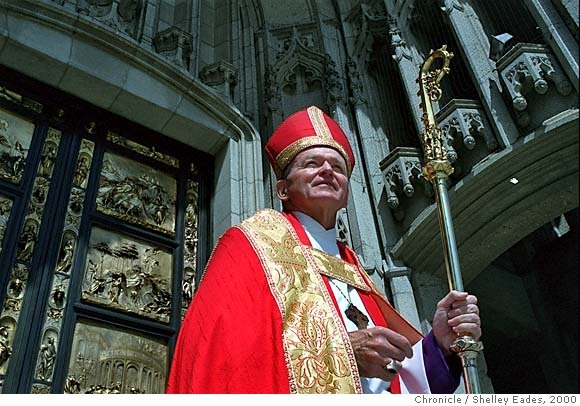 With lifetime tenure, such events are not common in the diocese. Each Sunday there has been an announcement from "the angel" (a wonderful lectern in the shape of an angel) detailing the process of the election and the people who are delegates to the election. There is a website that details the process and the candidates, and there are town meetings that allow parishioners to go and meet the candidates. There is active interest on the part of members of the congregation, and accompanying discussion about each of the candidates. Apart from the discussion about the election there is an active life with the bishop and the diocese. There is a visitation, or with Episcopal confirmation, the contact between bishop and candidate. In my years at Saint Francis, as events propelled us farther and farther from the national church, my discomfort at not having some kind of connection with the Church catholic grew and grew. I can recall conversations in with this distance was acknowledged and discussed by my colleagues, and parish leadership. "But who needs them (the synod - the bishop)?" "What do they actually do for us?" was often the reply. Now I know how important all of that was for me. Now I know the answer. Those bishops connect us! It is not about an independence that separates parishes from one another, or about jealous pastors and other leaders. It is not about having an ecclesiastical landlord, peering over everything that a parish might want to do. It is about the differentiation of ministry, and about working together in the Church. It is about community and a shared tradition - and the freedom of the Gospel. It's about family. >>>NOTE: Since I wrote this, my wonderful partner in life, Arthur Morris, handed me a correction sheet noting misspellings and grammatical errors, and adding this comment, which I think is quite pertinent: "Doesn't the short-term status (of Bishops in the ELCA) really (give) non-elected 'assistants' power, by relying on them to keep the church or synod (in times of transition) through various bishops' terms." It is an excellent point, an observation that bespeaks either continuity, or an entrenched bureaucracy.